It is amazing how the absence of a person leaves a vacuum so much larger than I knew. I had never thought Mr Lee Kwan Yew’s passing will affect me so hard, but it did. There are floods of videos and documentaries of old footages of his speeches, interviews, etc and as I watched them, it blows my mind how little I know of him. In his lifetime, he brought a nation from a third world country to first world! In his lifetime! One thing that stands out to me is his PASSION. Particularly, his passion for Singapore. With his calibre, I am sure he could have been a super successful lawyer, or even a politician in a bigger nation with more resources and prospects (at least at the point in time when he started). Yet, he chose Singapore, which at that time was nothing but a small island under British colony, and followed by Japanese occupation. He did not just chose Singapore, he loved Singapore. This love was not the lovey-dovey mushy kind of love. More often than not, tough love. Mr Lee Hsien Long calls it an “abiding love“. A love strong enough for him to give his life for Singapore. Managing a family, a company and/or community is a task enough to crush many. Here we have a man who not only took good care of his family, but also the whole nation, bringing us out from swampy marsh land into a clean & green nation. In one of the interviews, one of the Singapore ministers recalled Mr Lee Kwan Yew advised him to spend time with his children and teach them well. Mr Lee did not give up his family in pursuit of the vision. He embraces his family so that they move together with him. I was completely blown away to find out that Mr Lee was not willing to single-minded focus on economic growth to jeopardise environment and other basic living amenities. He chose to plant trees, and even embarked on cleaning the stinky Singapore River which took 10 years! He put in place urban planning right from the start so that growth and quality of life advances in tandem with economic growth. He wanted the citizens to own their own homes, to take root and build their families here even if it means small flats. Many other nations consider the environment and comfort of citizens as the last phase of development, and often pursue growth at the expense of the grassroots people. He looks at building a nation holistically. Some may say even though economically we are developed world, but we have yet to learn the graciousness of a developed world. Yes, we are perhaps still need some catching up with our psyche, which is an ongoing process since we are all work in progress. But does this mean that we put down everything else that is good? I respect Mr Lee’s high moral grounds used to govern decisions that are difficult. Some may find Mr Lee’s autocracy restricting and without freedom. If Mr Lee had not bulldoze and made everyone move in the same direction, would we even have the freedom to talk about freedom now? There is a high chance that we will still be embroiled in racial riots, living in fear for our lives, be it from diseases, poor living conditions or crimes. Such scenarios are not pictures of freedom to me. 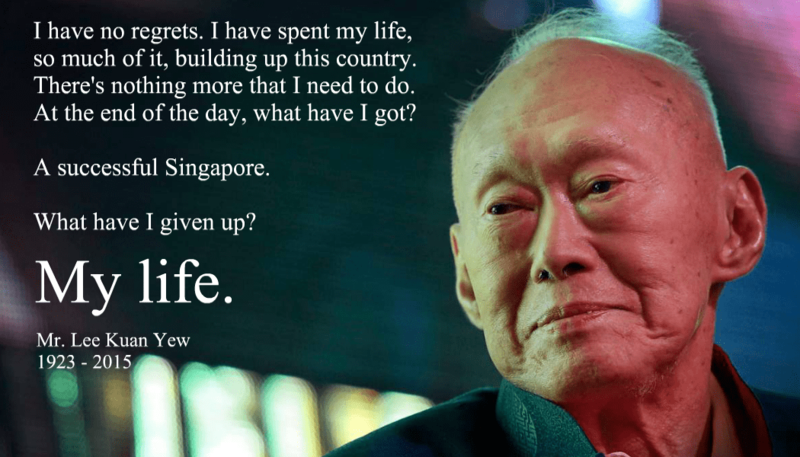 2015 is Singapore’s Jubilee year, and losing our founding father is such a hard thing. Not seeing Mr Lee at the National Day Parade will be hard. On the other hand, maybe it is time for the 50-year-old Singapore to grow up and mature. This is the ultimate test that whether we have learnt well from our founding father as much as he had led and lived well as an example for us all. God, lead us into this new chapter of our nation for You are the eternal Abba for us all!